Finally, a complete visual guide to the 4-3-3’s midfield! The midfield is the engine room of the 4-3-3. It’s responsible for moving the ball up the pitch and from where most attacks are launched. Put simply, you must have a tactically astute midfield if you want to score goals playing the 4-3-3. Now you can watch how midfield attacks are built and how to develop creative systems of play in this special series of coaching videos. Are your players constantly losing the ball in midfield? Do they know how to create scoring opportunities in abundance? Or are they clueless on where to play the ball? Now you can discover how to develop the mindset and technique needed to build a goal creation machine in midfield in this special video series. 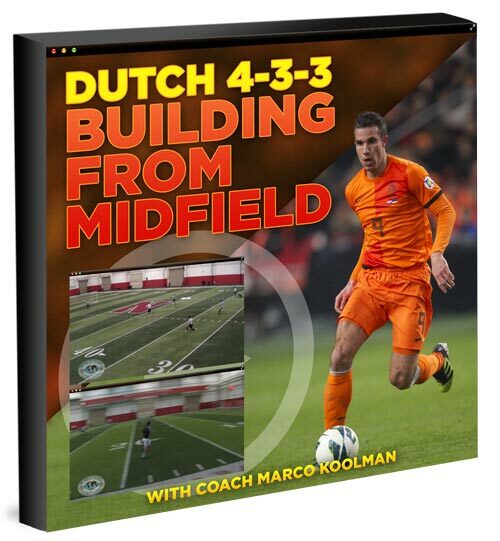 In Dutch 4-3-3 – Building from Midfield multi-NSCAA coach of the year Marco Koolman demonstrates how to run a complete coaching session focused on the midfield. He explains all the fundamental principles of an effective midfield and how to develop the key systems of play. Drills are provided along with coaching points that will develop your players’ understanding of how to connect with the defense and where to play the goal to create goal scoring chances in abundance. If you want to improve your midfield’s performance, this video series provides the perfect blueprint. It’s packed with valuable insights that will improve your understanding of the 4-3-3 midfield and how to build many more attacking opportunities and score more goals. Something all the elite sides that play the 4-3-3 have in common is a highly creative midfield. This is because it’s the midfield that drives the team’s success when playing this attacking formation It’s where a simple pass from defense is turned into a goalscoring opportunity and where intricate passing triangles are created all the way into the opposition’s box. But in order to build an effective midfield you need to ensure that your players have an understanding of how to create space and where to play the ball. Dutch 4-3-3 Building from Midfield is a video series focused on developing the mindset and systems of play needed for an effective midfield. In each video Marco Koolman provides expert insights and practical examples on how to drill your players to develop in these areas and how to give them a better understanding of the midfield’s role when playing the 4-3-3 formation. The 4-3-3 is one of the game’s most attacking, flexible and popular formations. The key to harnessing it effectively lies in a well drilled midfield. Dutch 4-3-3 Building from Midfield shows you exactly how to do it and build a regimented, yet creative, core to your team. Marco Koolman was raised on Total Soccer as a teenager growing up in the Netherlands. He then moved to the US in 1991 to study business administration at Gannon University and to launch a highly successful coaching career. His first coaching role began straight after completing four years playing for Gannon’s Golden Knights, where he attained the team’s second highest ranking ever for assists with 44 to his name. 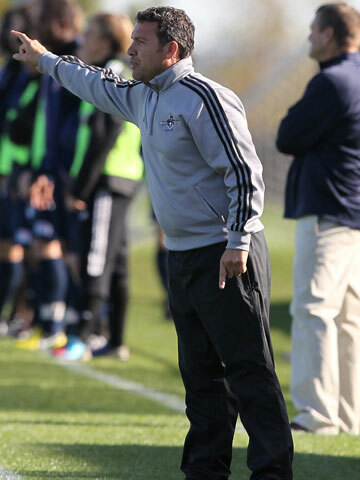 Building on the respect built as a player, Koolman took over the team’s coaching responsibilities for six seasons and won the NSCAA National Coach of the Year award in his third season. After leaving the Golden Knights, Koolman became head coach at the Franklin Pearce University. While there he helped the Ravens to make six consecutive appearances in the NSCAA Tournament and national runners up in 2005. 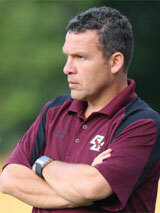 This led to him being named NSCAA New England Coach of the Year an additional three times. In 2007 the team finally claimed the NCCAA Division II National Championship, earning Koolman another National Coach of the Year award to add to his rising tally. Koolman’s growing reputation then took him to Boston College as associate head coach in 2009. While there he helped the Eagles to the third round of the NCAA tournament and a 10-5-5 record. A stint as head coach and Director of Soccer at Spire Institute then followed before Koolman was appointed head coach at the College of the Holy Cross. At his new home, Koolman has amassed a 201-75-28 record, the 13th all time highest in NCAA Division II history. The midfield is where you have space to make things happen in the 4-3-3. The closer to goal you get the more the numbers increase and the space is squeezed. This video series covers a complete coaching session on how to harness the space of a three man midfield to create more goal scoring opportunities. Koolman begins the session with a warm-up which helps players to understand their responsibilities in midfield. Players are split into two groups and given three balls for each line to move the ball around cones. This helps to develop a familiarity of how center backs will play the ball to advancing midfielders. In addition, the drill helps players to develop their concentration, focus and how to get into position to receive the ball. With creating space the key to harnessing the third man in the 4-3-3 formation, this warmup is great for timing runs and improving the quality of passing. The coaching session then shifts to focus on building the creativity of a three man midfield. Koolman highlights the importance of short quick passes, playing the ball to the right foot and how to get the ball out to wingers. Defenders are then added to the session to add pressure to the timing and quality of passes. The session is then progressed to include goalkeepers who distribute to holding midfielders. Koolman emphasizes the importance to always be progressing forwards up the wings and why they should play the ball deep for them to run onto. With the timing of runs up the wings key to playing an expansive three man midfield, an opposing defender is added to raise the pressure. Koolman ends the session by focusing on linking the midfield with forwards and discussing how you can force opposition defenders out of position with a roving third man. He then ends the session explaining the importance of moving the ball to the final third as quickly as possible and quick decision making is vital. Elite teams that play the 4-3-3 often have star players in the midfield. It is the midfield that is the engine room for creating goal scoring opportunities and for rapidly moving the ball from defense to the attack. This coaching session shows you how to build your players’ familiarity with the systems of play needed to play the 4-3-3 effectively. Koolman covers all the core principles of an effective midfield and how it can be used to pull opposing players out of position and create opportunities for the forwards. If your midfield is constantly losing the ball and unable to get it from the backline to the forwards consistently then Dutch 4-3-3 – Building from Midfield is vital viewing. This special video series shows you exactly how to develop the mindset and understanding of patterns of play your midfield needs to be effective when playing the 4-3-3. Whether you coach youth players or teams at a higher level, there are many valuable insights you will gain from the session which you can utilize on the training pitch to improve how your team harnesses one of the game’s dominant formations. WORLD CLASS COACHING is recognized globally for the quality of its soccer coaching resources, which are used by over 40,000 soccer coaches from around the world. We wouldn’t be offering Dutch 4-3-3 Building from Midfield unless it achieves our exceptionally high standards. However, if you are not 100% satisfied with the quality of Dutch 4-3-3 Building from Midfield after six months of implementing its small sided games and exercises then please contact us for a no quibbles refund. Ever since the formation burst into the world of soccer in the 1970s, the key to an effective 4-3-3 has always been the midfield. A well drilled and tactically astute midfield is vital for moving the ball around the pitch quickly and creating goal scoring opportunities. 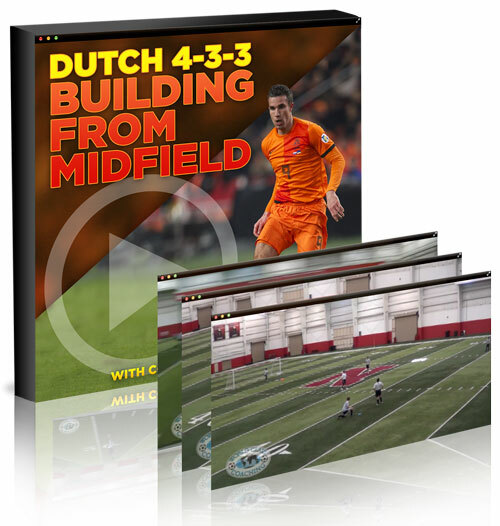 If your midfield needs better organization or a better understanding of where to play the ball, you can find out everything you need to know in the Dutch 4-3-3 Building from Midfield video series. Native Dutch coach Koolman demonstrates how to run a complete coaching session that will build your players’ passing technique, movement and tactical mindset for developing an effective central core to your team. After watching this video series, and learning from its valuable insights, you’ll be able to run your own coaching sessions and develop a midfield with creativity and the drilled mentality to move the ball quickly up the pitch. The result is they’ll be able to create more goal scoring opportunities and push the score line in your favor. P.S. Dutch 4-3-3 Building from Midfield features a complete coaching session presented by Dutch coach Marco Koolman. In the session he explains all the core principles of harnessing the 4-3-3 to build attacks from the defense and how to link them with an unpredictable triangle midfield to create more attacking opportunities and more goals. P.P.S If you are not 100% satisfied with the quality of the soccer coaching resources in Dutch 4-3-3 Building From Midfield six months then we will refund your purchase in full, no questions asked. One last thing. If you are an Elite Member, these videos are included as part of your membership so there is no need to purchase them here. Just log in to the WCC TC and click the Video Library and do a Keyword search for “Koolman”. If you are not an Elite Member, check it out here as you can have access to these videos and hundreds of others for one low price instead of paying separately for each set of videos.